I'm calling this dress, the Dorothy Dress. It's a sweet 1950s cotton confection, in baby blue and white gingham checks. Sprinkled with sprays of flowers, a sassy bodice, and a full circle skirt. Pure bliss. And just the thing to bring in spring while "April Showers brings May Flowers." Spring has been acting kindly here in the Emerald City. Mild weather, the showers are short, with bursts of sun through out the day. Denizens have come out in full force: petal pale limbs displayed to best soak up this the rare dose of solar vitamin D, and splayed across sidewalks and lawns, preparing seedbeds and gardens for the new season. Imported pansies and pals being dutifully plopped into the gaping mouths of Seattle soil, while gone native violets, daffodils and crocuses form floral choirs of fragrant and colorful blossoms across the cheerful landscape. We are entering the Celestial Season, where Seattle gives the gates of Heaven itself a run for the money as Best Place to Live. I am besotted with this town. And looking forward in exploring even more of the verdant and vibrant city this summer in my Dorothy dress. 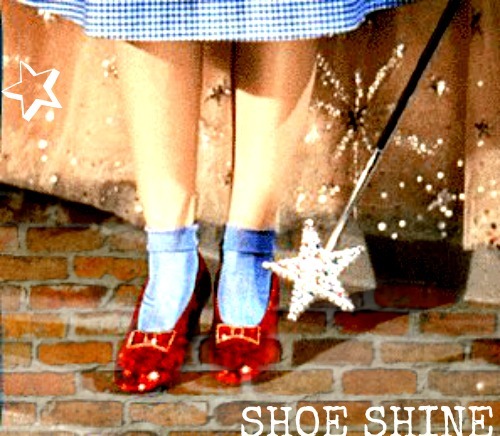 Reminder: Tomorrow is SHOE SHINE! Link up a post or pic of you in the shoes that make you feel like a star. This is a monthly community event, happening every second Tuesday. We want you, and your shoes, so come back, and share your kicks! 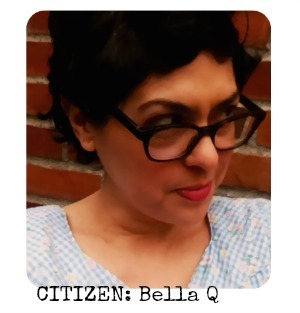 Bella Q is the steam engine behind the Citizen Rosebud. 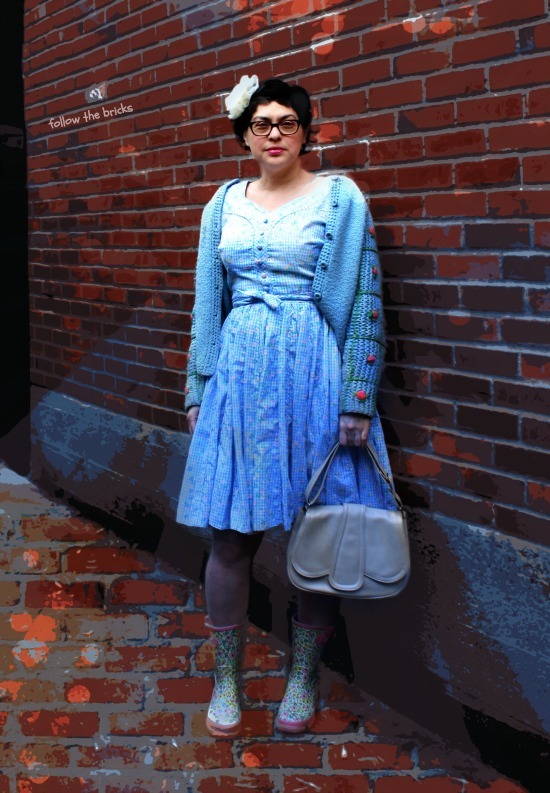 Wordsmith, artist + rabble rouser, she lives in Seattle, Washington. Currently pursuing her life's dream to create an artist's collective that works with secondhand sourced materials. She finds it awkward writing about herself in the third person, loves to go thrift shopping, and likes to feel beautiful. And she thinks you're pretty swell yourself. This is so beautiful! I love the rubber boots touch. You always with the best vintage looks. You looks so great ! The colours are so much looking like one of swedens most beloved little springflower .... anemone hepatica - its name in latin , cant translate . So indeed a spring outfit ! Thanks for sharing this springy, happy look with Visible Monday, Bella, and enjoy the day. Seattle is so beautiful. I adore that dress! Would have been perfect at my 1950's dance this weekend. Bella, you look so beautiful!! Love your new text about yourself, and wish that your dream comes true! Yeah Girl!! Pull out those words and paint us a picture!! Beautiful!!!!! Even before I read the text, I was entranced by the photo of you. Everything about it is good- you, the clothes, the location, the composition etc. Love it. The lions and tigers and bears should look out for you! 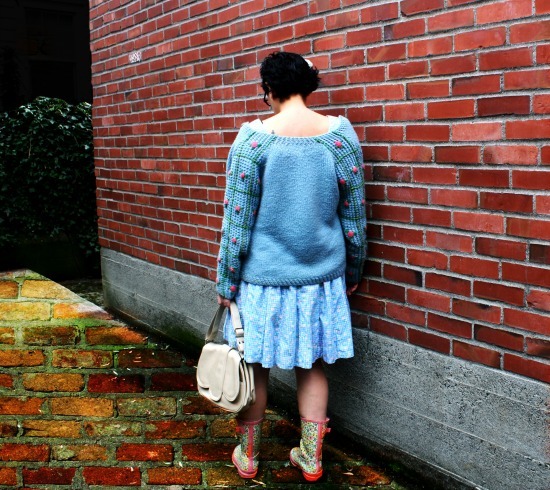 I love that dress with that sweet sweater. And your description of Seattle in the Spring is spot on! Seattle is indeed a lovely city. I have visited a few times and perhaps will get a chance to do so again. Your dress is really sweet and I love the rain boots with it. I love boots. Perhaps I love them even more than shoes, but I'm not certain. What an amazing dress! I love the whole outfit, and am so happy to hear you're loving Seattle. I just love the Liberty Rain boots - are they going to be in the Shoe Shine? I love this dress and it looks so pretty on you! You have the gift of making vintage read in a personal and expressive way. Hi, just to let you know I'm putting your 'pledge' on my blog because it fits in perfectly with the way I live my life - I'll be catching up with your posts soon. Ι love your dress but what I find so gorgeous on you is the light blue cardigan you are wearing!It looks so comfy! Awwwh. You always look glam, but you're extra pretty-glam here in your blue dress. Love the wellies!